Author and illustrator Kevin Burgemeestre tells us the story behind Kate, a graphic novel that tells the story of two young people and a battered, heroic hound through words and illustrations. Writing this novel parachuted me back into my teenage years. I was not a good teenager - I was not cool, not great at sport and, to top it off, I was a bit of a nerd. Like me, my main character in my graphic novel Kate is a nerdy character too and through her story I explore how she, an ordinary girl with an artistic bent, makes sense of the world once her support mechanisms are cut away. Her mum has died and soon after this momentous event her best friend goes to Canada, her favourite teacher leaves for an exciting new job and a horrible bully moves into the school. Kate’s life changes in an instant and she is completely out of her depth. She discovers Frida Kahlo’s paintings and finds them strangely comforting because they are about loss, pain and deal frankly with death, dying and the influence of the departed. Looking back, I now appreciate what a safe, supportive and loving family I had, and still do. When I think back to my teenage years, I realise that some of the seemingly cooler kids I envied didn’t have that luxury. Some had hostile family homes, got caught up in high-risk behaviour and drugs. 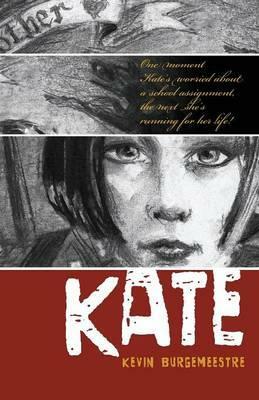 In Kate the character Mal represents that difficult and wild existence. Kate collides with Mal when he rescues her just as she is about to be violently assaulted. Though he comes from an extremely abusive home he’s a character of great resources, courage and kindness. When I was growing up there was a boy from my school who spent a lot of time at our place. I wondered why mum always welcomed him. She later told me his parents were alcoholics and when they were drinking they would beat him. It was such a surprise to me because he was one of the strongest, kindest and most forgiving people I knew. He was so much more mature than I was and I have often thought he deserved a much better deal. Mal is a tribute to him, and to other battered, overlooked and neglected children. As Kate’s situation darkens her pretty drawings of girl’s faces in make-up begin to change and start to reflect the disturbing changes in her life. Her self-portrait showing the influence of Frida Kahlo reveals that her house no longer feels like the safe place she was used to. There are dark figures lurking in the shadows. A banner remembering her mother floats in the sky and on the other side is a leaping picture of the dog Wilde. Wilde is another key character of the book, featuring in both Mal and Kate’s lives. While he has the traits of rugged, ancient dogs, his name also suggests he must be a sophisticated and knowledgeable being. Here, I’m indebted to a troubled teen I met whose hero and inspiration was the author Oscar Wilde. Finding him is especially fortuitous for Kate because despite the dog’s wounds, his primary instinct is protective and the bond they form proves crucial later in the story. When I was young my parents both worked and we were sometimes at home with just our two big dogs until they came home in the evening, so I’m familiar with that protective instinct. Our own mutts were also rescued animals and I don’t think they ever forgot that they’d been saved because they were the best companions and protectors. I’ve always believes dogs are an incredible comfort, especially to people suffering loneliness and depression and for this reason was very happy to support The Lost Dogs Home with this project. Writing this book constantly reminded me how lucky I am to have my family. Despite both my parents having spent their teenage years in Japanese prison camps, which could have filled them with hate and suspicion, instead they fought to instil a sense of hope in us, and a joy in meeting people from all cultures. I’m indebted to them for showing me change and loss are not the end of a story, so many young people I have known have not been so lucky.